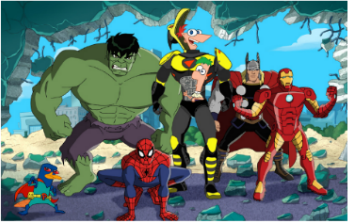 A special crossover episode of Phineas and Ferb in its fourth season with the Marvel universe. It first aired on Disney Channel on August 16, 2013. The plot goes that Phineas, Ferb and their friends are literally space surfing along a meteor shower and head back to their customized space station. At the same time Perry is battling Doofenshmirtz as per usual and breaks up his latest -inator which coincidentally happens to take away superpowers. In the midst of their battle, a stray shot manages to fire off before the machine is destroyed. And yet again at the same time in New York, Spider-Man, Hulk, Iron Man and Thor are battling against Red Skull, Venom, Whiplash and M.O.D.O.K.. Just as they're about to beat them, the ray bounces off the space station and onto the heroes, taking away their powers and allowing the villains to escape. After the heroes regroup on the S.H.I.E.L.D carrier, Nick Fury manages to track the ray back to Danville and Phineas and Ferb's house. So the four heroes head to the pair in hopes they can restore their powers. At the same time, the villains likewise manage to track the source of the ray to Doofenshmirtz (thanks to Doofenshmirtz bragging about it on the internet) in the hopes of gaining the heroes' powers for themselves. Can Phineas and Ferb save the day? Or will the villains actually take advantage of this opportunity and manage to take over the world? Adorkable: Candace when fangirling over the superheroes. Animal Superheroes: Perry, even moreso than usual. He dresses up in a rocket-powered superhero suit as a disguise and joins the Marvel superheroes in the final battle against the villains. Animation Bump: The fight scenes, especially when compared to Avengers, Assemble!. Arson, Murder, and Jaywalking: The final error message the space station gives when it drops out of orbit is "Social network friends defriending!" Autobots, Rock Out! : The song "Jump" plays during the final battle. Big Bad: Red Skull is the main antagonist of this special. Perry in a superhero garb saves the heroes in their second fight against the villains. Hulkjeet, Phineas and Ferb, Perry, and Doofenshmirtz arrive to help the captured superheroes before the penultimate battle. Candace and Isabella likewise do this at the end by unwittingly stopping Red Skull before he can activate his device and restoring the heroes' powers. Bigger on the Inside: The S.H.E.D. headquarters. The hot dog vendor's cart getting knocked over. Hot Dog Vendor: I moved to Danville cause I thought it was safer! Doofenshmirtz brings up the fact that he once tried MODOK's look once but found it difficult to maneuver through doors. Later, MODOK has trouble fitting through one of Doof's doors. Brought Down to Badass: Once the superheroes get some help from Phineas and Ferb and their friends and a chance to exercise their ingenuity, they put up a pretty good fight against the villains even without their powers. Brought Down to Normal: What kicks off the whole plot with the Marvel heroes losing their powers. Red Skull: What was that beaver... duck... thing?! The Cameo: Stan Lee as usual, this time as a hot dog vendor as well as the narrator of the story. Car Fu: The superpowered version, of course. Then MODOK makes use of telekinesis to try pushing a street sweeper into Iron Man, who just catch it and throws it back at MODOK's face. Candace's knowledge of the Marvel universe. Clown Car: Mocked when a hulked-out Baljeet lifts a car during his rampage, and about fifteen clowns exits from it and flee. Colony Drop: The Phineas and Ferb Space Station drops onto the enemies, but they survive via MODOK's force field. The Comically Serious: Red Skull from the villain's side, and Nick Fury from the heroes' side. Continuity Nod: The Beak suit returns, as does Buford's bear suit. Crossover: The whole movie. Also, it's mentioned that Candace became a Marvel fangirl due to an in-universe crossover between them and Ducky Momo. Crouching Moron, Hidden Badass: Baljeet, once he gets Hulk powers. Curb-Stomp Battle: The depowered heroes suffer a few of these at the hands of the villains, but return the favor once their powers are restored. Delayed Reaction: When the gang and the superheroes are conversing in Phineas' kitchen, Candace walks in and starts laying down ground rules now that she's in charge. Candace: That means no shenanigans — hey, Spider-Man — so I'll be over at Stacy's all d-duh-duh-duh-daaaaay? Did You Just Flip Off Cthulhu? : Buford (a completely normal preteen boy) whacks Red Skull (one of the most dangerous villains in the Marvel Universe) in the face with a fish. And he gets away with it! Dramatic Unmask: At the end when the kids try to unmask Perry in his superhero outfit. He has another one underneath it shaped like Ducky Momo.Useless trivia The final shot of the mask and costume on a wastebasket could be an homage to the famous "Spider-Man No More" scene from the comics ◊. Edible Ammunition: When Doofenshmirtz joins the fight in the end, he chooses to use, of all things, an inator that fires waffles as projectiles. Enemy Mine: Though there is no official teamup, Doofenshmirtz is essentially fighting on the same side as Perry by the end of the episode. Exactly What It Says on the Tin: According to Doofenshmirtz, his Multiheliotacticalbaboonglominator is this. Extra Long Episode: The second hour-long episode after Summer Belongs To You. Eyepatch of Power: Spoofed with Major Monogram when Fury is briefing Perry on what's happening. Fury notices he suddenly has a eyepatch but Monogram claims its a medical issue. Though Carl quickly points out he's trying to look cool. One cutaway later and Monogram has two of them on. Face Palm: Nick Fury does one after dealing with Major Monogram, and Red Skull later does the same in response to Doofenshmirtz. Fangirl: Candace turns out to be a major one of superheroes. Who knew. Fantastic Racism: Red Skull apparently hates people from Drusselstein. Which makes sense; the guy's a Nazi. Grievous Harm with a Body: During the ending battle, Thor and The Hulk play a short game of badminton....with Venom in place as the shuttlecock. Handshake Substitute: Baljeet shares a fist-bump with The Incredible Hulk. Pretty awesome. Holding Back the Phlebotinum: Doofenshmirtz's disintegrator-inator could have easily saved the day, but Doofenshmirtz doesn't even remember that it exists until halfway through the climax, and the conflict is resolved by the time he plugs it in. Hulking Out: The Hulk himself is perpetually seen in his Hulked-out state, even after he loses his powers. Played straighter though by Baljeet after he is accidentally hit by gamma rays. Improvised Weapon: During the penultimate battle, Spider-Man uses golf equipment, Doofenshmirtz uses waffles, and Buford uses a dead fish as weapons. Insane Troll Logic: Candace uses this to determine the proper way to release the superheroes' trapped powers. Jerkass Ball: Phineas has never been shown to be as short-tempered and harsh as he is in this special. A little justified though as he's under pressure with the world at stake and all. He goes back to normal at the end of everything. Keep Away: The penultimate battle consists of the good guys using everything they have to keep the villains from obtaining the reactor core that powers their destructive machine. The villains do retrieve the reactor core eventually, but it goes on long enough for Candace and Isabella to bring back the superheroes' lost powers. Knight of Cerebus: Red Skull is by far, the most dangerous villain to enter Phineas and Ferb's setting. Lampshade Hanging: Isabella comments to Candace how detached they are to helping the heroes because "the female heroes didn't show up." Legion of Doom: Red Skull leads a new Cabal not unlike in Avengers, Assemble!, but this one consists of himself, M.O.D.O.K., Whiplash and Venom. Lighter and Softer: Well, not compared to the base show, but this may be the least threatening Red Skull ever. This is a man who helped implement the Holocaust. Doofenshmirtz: I thought this was supposed to be a special extended episode. Most Fanfic Writers Are Girls: This episode reveals that Candace writes Marvel fanfiction. Multi Layer Facade: When Buford tries unmasking the mysterious platypus superhero, his secret identity turns out to be...Ducky Momo. Then Perry shows up, and we see a Ducky Momo mask discarded in a nearby trash can. Mundane Object Amazement: Thor is fascinated by a juice box. Apparently Asgard doesn't have anything like them. Musical World Hypotheses: Only Trying To Help is the only song thats Alternate Universe; all the others are sung as offscreen All In Their Head. Mysterious Protector: Perry shows up at several points to aid the heroes without any of them knowing his true identity. To a lesser extent, Doofenshmirtz. The heroes have no idea who he is when he joins the fight against the villains. Nice Job Breaking It, Hero! : Candace twice when she prematurely activates Phineas and Ferb devices to restore the heroes' powers. The first time it mixes up the power, the second time they wind up hitting the wrong person. Her second slip-up does pay off though during the penultimate battle. Non-Standard Character Design: The Marvel superheroes and supervillains stand out sharply when side-by-side with the Phineas and Ferb characters. Oh, Crap! : After the heroes get their powers back. Red Skull: It seems our window of opportunity has closed. O.O.C. Is Serious Business: You know the stakes are high when Phineas snaps not once, but twice. It's especially notable in that this is probably the one time in the show's history that Phineas is actually aware of the full gravity of the situation he's in. The Oner: A Shout-Out scene to the The Avengers. Only the Chosen May Wield: Even with a copy of Thor's powers, Iron Man can't use Mjölnir because he's not worthy. Pass the Popcorn: The kids's reaction when the Marvel heroes finally get their powers back and proceed to utterly wreck the villains. Poke the Poodle: Doofenshmirtz leads the supervillains through town doing "evil" deeds that can only be considered this at best. Doofenshmirtz: "Let's get ice cream and spoil our dinner!" It takes a while for Doofenshmirtz (being Doofenshmirtz) to remember that he could simply use his disintegrator-inator to defeat the supervillains. He then gets sidetracked trying to find a long enough extension cord to power the inator and only activates it after the battle is over, in time to vanish Phineas and Ferb's crashed space station. It took time until he found a cord as long as needed or realized a longer cord would do. For some reason, Perry doesn't use the wire cutters he had with him all along to break him and Doofenshmirtz out of the cages they are trapped inside until Doofenshmirtz asks him whether he has any powers to help them escape. Waiting a while to escape the trap seems to be OWCA standard procedure. Shamu Fu: Buford's fighting style of choice in the penultimate battle. The pan shot before the final battle and Hulkjeet's rescue of Iron Man (complete with "We have a Hulkjeet") to The Avengers. "I should've warned her not to make Phineas angry. You wouldn't like him when he's angry." Complete with the sad piano music. Ferb says that the S.H.E.D. headquarters being Bigger on the Inside is borrowed from British sci-fi technology. Some Marvel characters who don't appear still get referenced, including Ghost Rider, Aunt May and — of all characters — Howard the Duck. Doofenshmirtz trying to prove himself worthy of joining Red Skull, only for the latter to abandon him because of his sheer incompetence is reminiscent of Justin Hammer's attempts to impress Red Skull in Avengers, Assemble!. What adds to this parallel is that both Doofenshmirtz and Justin Hammer are scientists. Take That! : When Major Monogram introduces Perry to Nick Fury of "S - H - I - E - L - D."
Nick Fury: That's S.H.I.E.L.D. It's an acronym. Major Monogram: Oh, like O.W.C.A. Nick Fury: Yes, except it's cool. Third Time's the Charm: Candace reasons that since she has failed twice already, she won't screw up a third time. This at first seems like Wrong Genre Savviness when the space station shuts down, but it turns out to be exactly what's needed to halt the villains and restore the superheroes' powers. Title-Only Opening: This episode doesn't play the title theme, just Phineas and Ferb rocking out on guitars as the title comes up from the ground. With Spider-Man taking over Candace's role. Spider-Man: Aunt May! Phineas and Ferb are making a crossover! Trailers Always Spoil: Several promotional images and clips revealed the existence of Hulkjeet as well as the Big Damn Heroes sequence in the penultimate battle. Took a Level in Badass: Baljeet gets to Hulk Out. Villain Teamup: Subverted, once Red Skull sees how inefficient Doofenshmitz is. He and the other villains quickly abandon him and take one of his devices for themselves. Villainous Rescue: Doofenshmirtz's interference frees three of the captured superheroes towards the end. Vot Ocksent: A number of jokes are made at Red Skull's expense because of his accent. Weaksauce Weakness: The new (but not yet fully functional) Beak suit is not waterproof. What Kind of Lame Power Is Heart, Anyway? : When the powers are switched, Hulk gets Iron Man's, which doesn't mean a whole lot without the suit. Hulk: I am feeling entrepreneurial. Worf Had the Flu: The lack of (or, at one point, switched) superpowers leads to the superheroes being curbstomped several times. In addition, Phineas and Ferb's new Beak suit is only partly functional and is broken in both of the battles it is involved in.